1) How to create an Android app with Phonegap using Eclipse? So friends today I’m posting for how you can reset your WordPress password from phpMyAdmin. This technique is not particularly a technique for a reset, but it does allow you to totally reset your password. It just requires a few additional actions, and a little basic knowledge of MySQL. This guide in particular will be using the MySQL from our hosting cPanel. 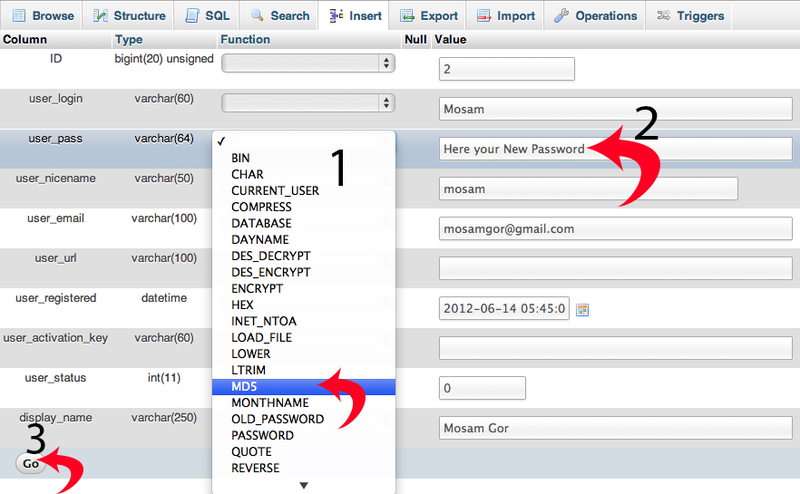 Step 2: Search to the symbol for phpMyAdmin and just click. Step 3: Simply select the database table that connect with your WordPress website. In fact, if you do not know what database is connect with your website don’t worry, open the wp-config.php to find out. Step 4: Search for wp_users and just click to open this database table. Step 6: As you can see in this image, there is a position to put a security password. When you first see, it, it will look like a lot of alphanumeric character are in that area. eliminate those characters and put your security password you want. The different characters are there because WordPress only identifies security passwords by means of MD5 security. You will want to put your own security password in the writing area and then choose MD5 in the drop down menu. Once you have done this 3 steps , simply select the button that says GO and your security password has been totally reset. This is something unusual kind of problem but is very helpful if ever faced in such a trouble. Your images are clear enough to explain and the post is easy to follow. Thanks for writing about it. Its nice information for WordPress users. So they don’t need to contact their hosting company every time when they required password reset or else. This is indeed a great resource, i remembered being in such a fix someday when i was a newbie blogger and almost deleted my blog because i couldn’t login to my dashboard. I hope this helps other people who may find themselves in such situation. hello mosam and charmie. thank you for sharing this tip since i also suffer sometimes in short term memory lost. at least i know what to do when reseting passwords. i usually write clues of my passwords on my journal to remind myself which password should i use. Hi Mosam, many times this happens that we forget password and this post will be very helpful. Thanks………. Thanks a lot author! This is the trick I was looking for, since my website was stuck and I had no clue how to proceed. Once again, thanks!